“No Company Open” window not found! QuickBooks user used to have a “No Company Open” window when they launched the QuickBooks program without any company file opened. 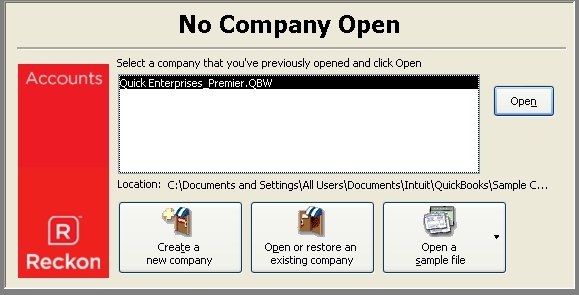 This “No Company Open” window contains a list of recently opened company files and functions where they can “Create a new company” and “Open or restore an existing company”. However, in Reckon Accounts 2013, some Window XP user may find that this “No Company Open” window no longer can be found. Launch Reckon Accounts 2013 and open up your company file. Close your company file and follow by closing your Reckon Accounts 2013. Launch Reckon Accounts 2013 again and you should see the “No Company Open” window with a list of your recently opened files. This entry was posted in Accounting, QuickBooks, QuickBooks Australian version, Reckon Accounts and tagged accounting software, QuickBooks, Singapore, Small Business Accounting Software, software. Bookmark the permalink.